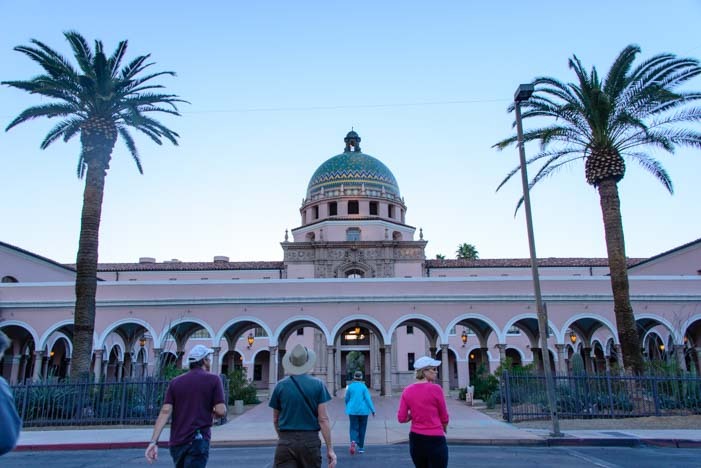 February 2016 – During our RV travels to Tucson, Arizona, we had a chance to delve into pre-history when we saw the petroglyphs of Saguaro National Park, and we also experienced the deep Spanish roots of this southwestern city at Mission San Xavier del Bac. While in town, we met up with some very special friends who took us on a walking tour of the older historic part of Tucson. Here the old Mexican flavor of the area intensified. 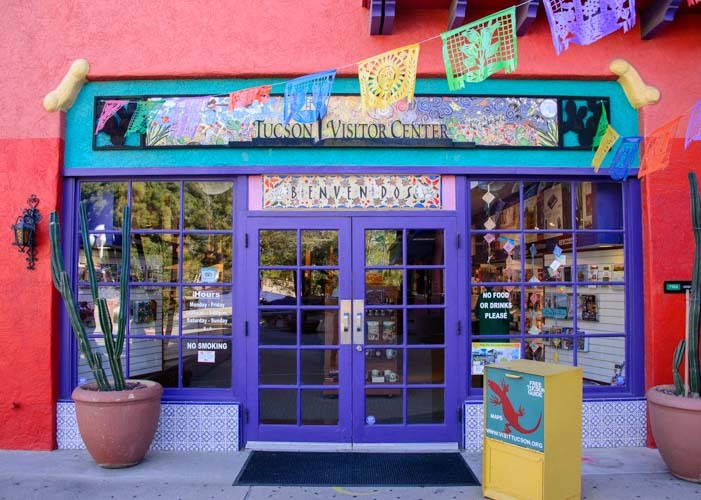 Tucson’s Visitors Center – Yup, this is an ARTSY town! 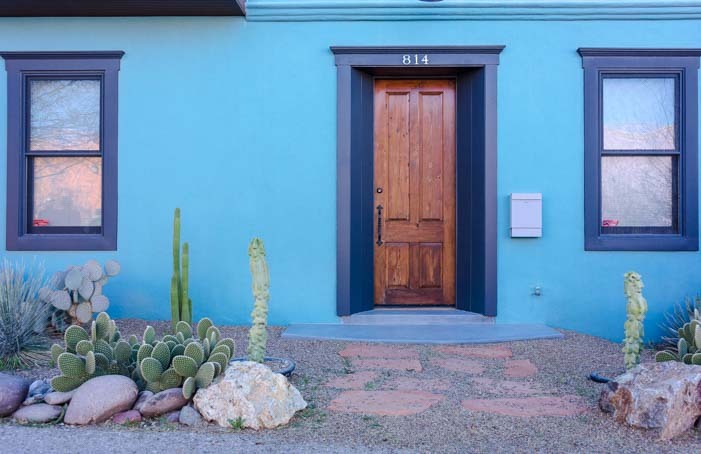 The homes in the older parts of Tucson are all made of adobe, a sun-dried clay, and the walls are enormously thick, often 8″ or more. These super thick walls offer excellent insulation and keep the interior of the house cool in the blistering heat of the summer. 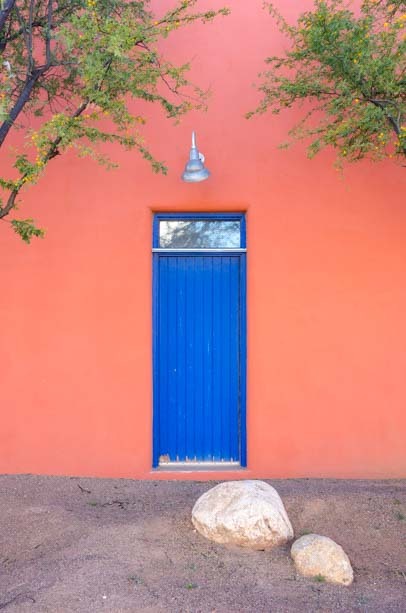 The buildings are painted many different shades, and we had a field day taking photos of all the doors. One building had several multi-colored doors all in one wall! 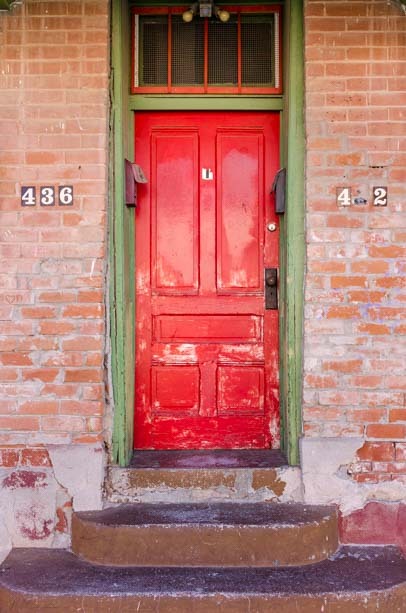 A door of every color…! We wandered past the old courthouse too. What a wonderful old structure! 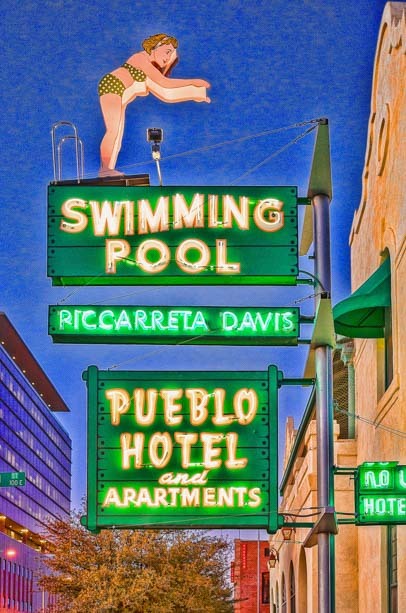 At one point in our stroll, we passed the classic neon sign for the old Pueblo Hotel. The hotel has been replaced by offices now, but what a great throw back to yesteryear. What a fun neon sign! 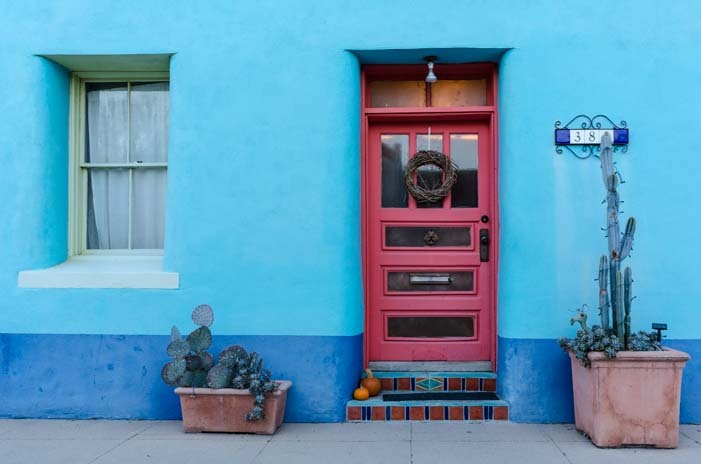 Tucson is a very fitness oriented city, and with its comfortable evening temperatures year round, lots of people enjoy getting out for a brisk walk after dark. Our friends introduced us to a unique Tucson event that gathers walkers and joggers together every Monday night, called Meet Me at Maynards. We joined the Meet Me at Maynards crowd at their starting point in front of the Hotel Congress where a band was playing. Meet Me at Maynards is a special weekly Tucson gathering of walkers and joggers. 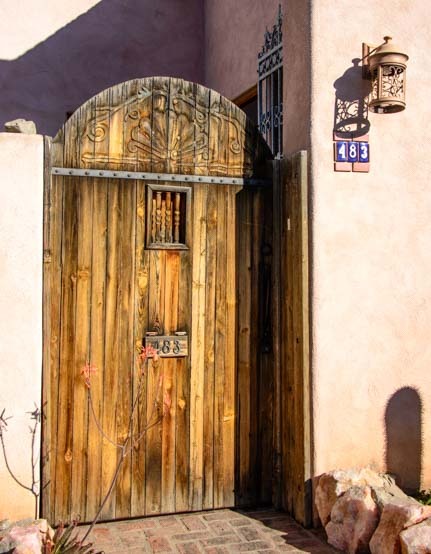 This is an informal and free spirited walk, and we wandered all through the streets of Tucson for three miles (the full walk is four miles). Towards the end of the walk we went through an intriguing spot where clusters of modern day hippies were hanging out with the homeless. It made for an interesting mix of sportily clad walkers/joggers making their way between folks with dreadlocks sitting cross-legged on the ground strumming guitars and singing. 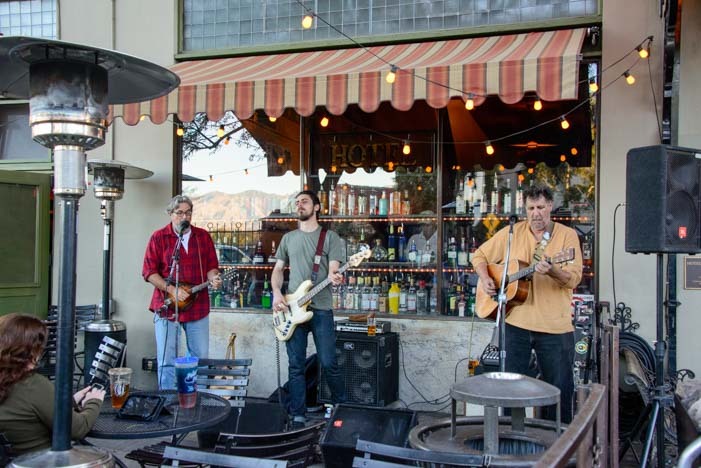 At the end of the walk, everyone gathered in front of the Hotel Congress to enjoy the live music over a beer. What a fun and utterly urban neighborhood event!! Back at Hotel Congress the band was playing and the beer was flowing. What a great gig! The “problem” with following your blog is that my Bucket List just keeps getting bigger! 🙂 Thanks for sharing! Very funny! The problem with living our life is that our bucket list keeps getting longer too!! There are just so many great places to see in this world. So colorful and fun! 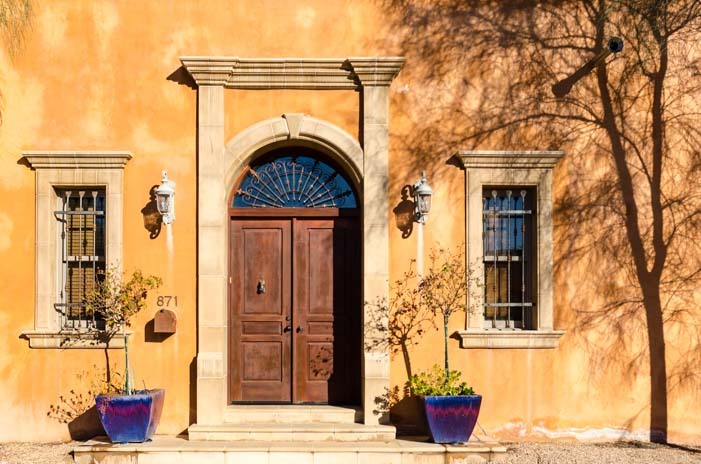 We always enjoy strolling through interesting towns and photographing architecture — towns in the southwest seem to be especially photogenic. 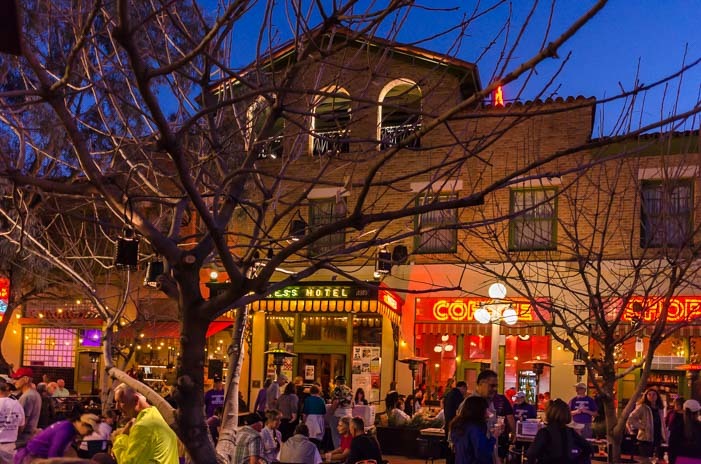 That neon sign you found is terrific, and “Meet Me at Maynard’s” looks like a blast — we’ll check it out next time we’re in Tucson. 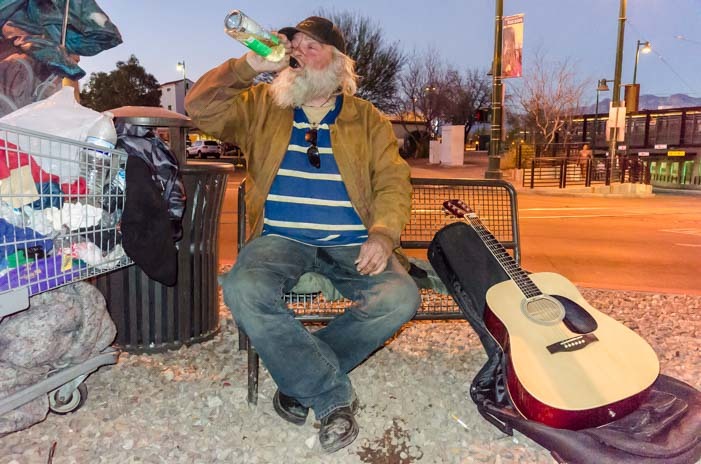 Tucson is a lively and photogenic city! 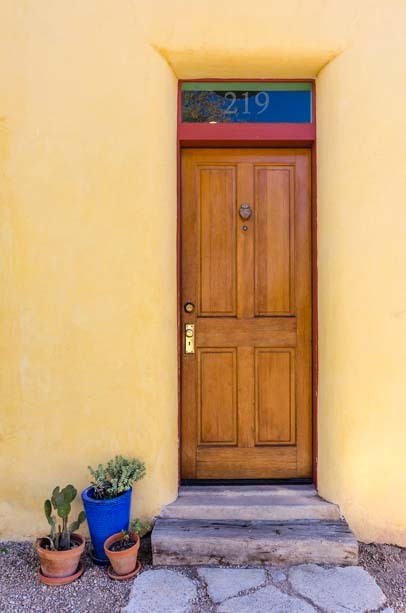 Loved all the colorful door photos! I hope I can get back down to Tucson to follow your footsteps before it gets too hot! Thanks, Janis! Come on down! It is getting warm, though, that’s for sure — crazy warm for this time of year!!! Love your blog! Been following it for about a year + now since researching teardrop trailers and places to visit and camp. Question: What barrios did you visit and photograph? I’ve researched barrios Viejo and Santa Rosa. Hi Andy – Thank you for following us for so long! 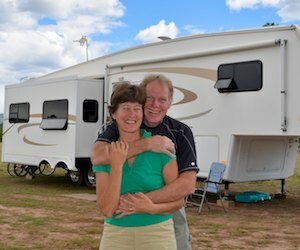 We love those teardrop trailers. Easy to park and so darn cute! I’m ashamed to say that I don’t know what barrios we were in, except we walked south from the Visitor’s Center on both Stone Ave. and Scott Ave, and at one point went past the old Scottish Rite Masonic Lodge. Here’s a map link showing the Masonic Lodge location (very cool building).